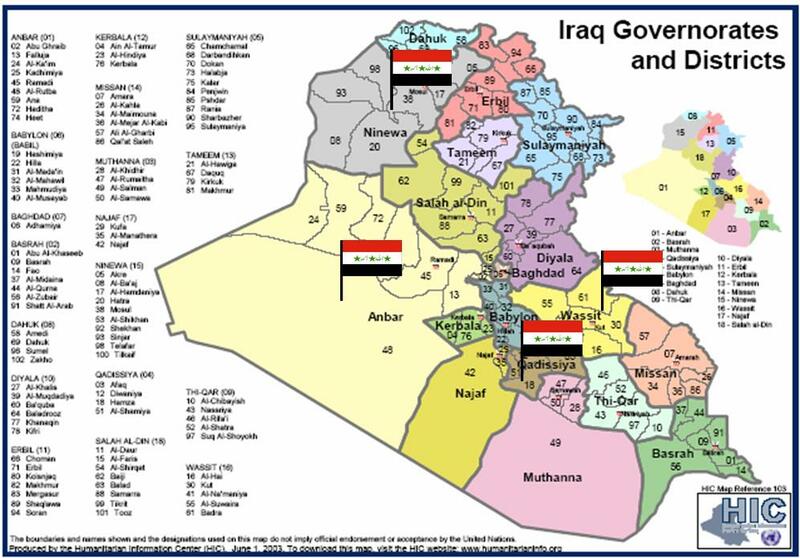 In the last ten days Iraqi news sites announced that Iraqi forces will take over security in these provinces: Al Anbar, Diwaniah (or Qadisaya), and Wasit, along with the city of Mousul in Ninawa Province. The following is a Haider Ajina translation of a headline and news published by the Iraqi Arabic newspaper Aswat Aliraq on January 24th 2006. “Major General Jamal, commander of the second division of the Iraqi Army, which is responsible for Mousul, announced that the Iraqi Army is ready to take over full security responsibility for Mousul. “Multi national forces have turned over full security responsibility for Makhmour county over to the Iraqis a few weeks ago”. Iraqis are increasingly and enthusiastically taking over more and more of their security responsibilities (as they should). The confidences they have in their capabilities are due to our training and their ownership of their country. Iraqis know that the rule of law protects them, they are free, they have a voice in choosing their government and they are preparing Iraqi for their children. Violence in most of Iraq is minimal. Sixteen of the 18 provinces are in relative calm and secure. 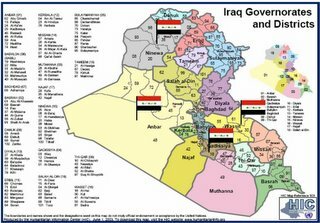 The last two provinces Al-Anbar (Ramadi is the provincial capital) and Baghdad are the last stand for Alzarqawi & some Saddamists to destabilize the country and stifle democracy. As you may have read, recently Ramadi has asked for help to defeat Alzarqawi and is training its security forces recruits to fight Alzarqawi (by the way we are doing the training and supplying the assets). This leaves Baghdad the capital and most populace city. In Baghdad the media is the densest, collateral damage at it highest and media attention at its most focused. This is were the terrorist get the most media bang for their actions to create the illusion that Iraq is a hopeless case. In fact the situation is quite the opposite. The following is a Haider Ajina translation of a news release by the Iraqi News Agency on January 26th. Iraqi security forces take over total security in south central Iraq. Iraqi security forces have taken over total security responsibility in Diwaniah & Wasit provinces from multi national forces on January 26th. This hand over of responsibility took place during a signing ceremony, which was attended by lieutenant general Peter Cearly commander of the local multi national forces, lieutenant general Khather commander of Iraq ground forces, general Peter Zerwinski and general Uthman Ali from the Iraqi Army. As well as the provincial governors of Diwaniah & Wasit, chiefs of police and border guards, Polish ambassador Raizard Kristosk, general Casey commander of the multi national forces in Iraqi, general Nezar Iraqi deputy chief of staff, local tribal leaders and employees of the provincial executive office. The local multi national forces in cooperation with Iraqi security forces have been training Iraqi forces since early 2005. The local multi national forces trained Iraqi Army units with trainers from Poland, Ukraine, Bulgaria, Salvador, and U.S. The training was a highly condensed and concentrated on border patrol and the Iraqi 8th corps. Iraqi units had patrolled and fought along side the multi national forces and performed admirably because of the excellent training they received from the multi national forces. In September of 2005 and as a result of good training and cooperation the multi national forces vested six phalanxes from the Iraqi Army’s 8th corps which is deployed in Babylon, Diwaniah and Alkoot. The next step was to vest whole divisions. In November Iraqi second division in Babylon and third division in Alkoot were vested. By January 20th 2006 training ended at the Corps level and created the 8th corps of the Iraqi Army. At the same time the multi national forces trained Iraqi border patrol in Alkoot province and assisted Iraqi police. Thus the multi national forces have trained 20,000 soldiers and Iraqi police. Iraqis are taking over responsibility of their security at a rapid rate. City after city and area province after province is gradually moving security into Iraqi hands. The gradual careful and methodical patient steps taken to train Iraqis and working with them till they are ready to take over will reap tremendous benefits for democracy and the rule of law in Iraq, for now and future generations. Iraqis must trust their security forces to enforce the rule of law and not be the oppressive arm of the government as they had done during Saddam’s rule. I am certain we will be reading of more and more areas transferring security to Iraqis. The day the number of our men and women serving in Iraq will start declining is getting nearer and nearer. Our patience and tenacity has been reaping its rewards and will continue to do so. Dar Alhayat news, via Haider Ajina, last week reported that Iraqi forces were taking over for the US forces in the violent Sunni Province of Al Anbar. Back in June 2005 of the 1,630 U.S. troops who had died since the war began, more than 500 had lost their lives in Al Anbar, a higher toll than in any other area of the country, according to icasualties.org, a Web site that tracks military deaths. There is a great roundup of Iraqi security news at No End But Victory (via Instapundit). On Saturday, General John Abizaid, commander of the US Central Command, announced that the US cut troops in Iraq by 20% in the last two months. In Al Anbar Province, Iraqi “tribes” arrested 270 foreign terrorists this week as reported at Iraq the Model. This news makes the “Civil War” comments from Representative Murtha on Thursday sound even more ridiculous.